Tests kits for some less common, pool and spa test factors. Scroll down to browse through information on some Pool and Spa Water Testers, for special and less commonly performed test factors. They can help you get to the root of a problem and help find the proper solution. The Website Store Directory contains an alphabetized listing of all products for sale. We don't just sell products. We help you make a better-informed choice, by providing all the information, you might require. Need ordering help? Scroll down the page, for the Order Desk Telephone Help Number. All items ordered will end up in the same shopping cart, no matter which page of this website, the items are located. All Major Credit Cards and PayPal are accepted. Order one today. Some Pool or Spa water tests are not included in some water analysis labs, but need to be added on. In most cases, these tests are not performed on a regular basis, as are pH and chlorine. Still they can be very important, when looking to solve a particular problems. Individual Specialty Test kits are available for the following: Iron, Copper, Copper and Iron MetChek Kit, Phosphates, Manganese, Residential 4-way Test kit, Chlorine FAS-DPD Test Kit, Sodium Chloride (salt), Biguanide and pH and Biguanide, pH and Shock. The right tester can determine proper treatment, for many common pool and spa problems, such as: Heavy Metals, Staining, Discoloration, Algae, Mold, High Chlorine Usage, Odor, Well Water Issues and Inadequate Sanitation. Don't settle for anything less than factory-fresh, with a complete factory warranty. Choose from 10 models, for every pool or spa owner or professional need. No more color-matching or guesswork. Simple pictorial directions. PockeTesters are electronic, dip and read testers, that can perform a variety of important pool and spa tests: Salt, TDS, ORP, pH and more. 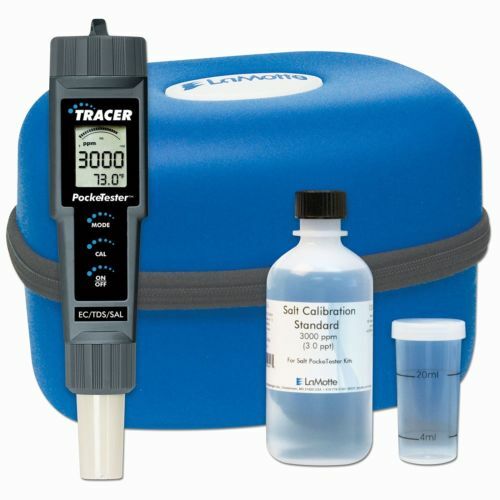 WaterLink SpinTouch Labs are the ultimate Pool-Spa Testers. So simple. So easy. So precise. Available in 4 Models: In-Store, Mobile, Commercial or Drinking Water. Insta-Test features a full-range of instant reading strips, from strips with multiple tests, to test strips for less common, but still important water test factors. 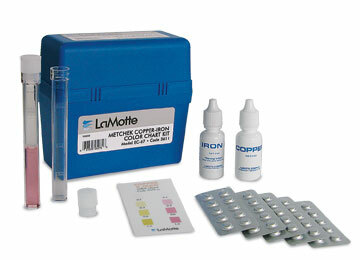 We provide factory-fresh replacement chemicals and supplies, for every LaMotte tester, sold. for Pool and Spa use or other applications. Scroll down for Specialty Test Kits Product and Ordering Information. Scroll down for Specialty Test Kit Model specifics and to place an order. This axial-reading Comparator kit for measuring iron, was especially designed to detect low iron levels: from 0.0 to 1.0 ppm. The reacted water sample is compared to the color standards in the comparator block, by viewing along the length (axial) of the sample tube. This design permits better low range accuracy. Iron can cause staining and discoloration problems, without proper treatment. 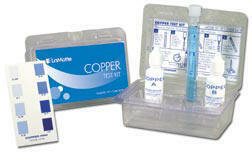 A simple color chart kit for measuring Copper from 0.05 to 1.0 ppm. Eight color standards are provided on the chart. Economical and easy-to-use. Suitable for confirming the performance of ionizers and mineral sanitizers or for determining the possibility of heater corrosion. 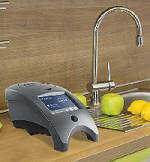 Use it to determine if the source water contains copper, which might require treatment with certain types of chemicals. The #2067 ColorQ COPPER Pool/Spa 5 is one of 3 all-digital testers, that test for Copper and Iron, as well as some other important tests. Eliminate all the color-matching and guesswork. Use this link, for complete information. The test kit uses a color chart that measures Copper and Iron levels at 0.1, 0.3, 0.6 and 1.0 ppm. The test kit is simple to use with just adding 3 drops of Copper reagent to a 5 ml. test tube of water then matching the color reaction to the color chart. The Iron test is measured by adding 5 drops of Iron reagent along with an Iron TesTabs® tablet to a 5 ml. test tube of water then match the reacted sample water with the color chart. Included with the kit is an easy to read diagrammed instructions, test tubes, color chart and enough testing chemicals to perform 50 tests. Being able to test for these metals will enable proper treatment and will increase the success rate. A simple color chart kit for measuring Phosphate from 0.0 to 1000 ppb. Eight color standards are provided on the chart. Economical and easy-to-use. Suitable for confirming the performance of phosphate-removing chemicals or the presence of phosphate levels, that can lead to accelerated algae growth, without proper treatment. 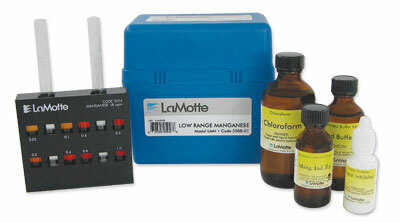 A simple Octet Color Comparator kit for measuring manganese from 0.0 to 1.0 ppm. The reacted water sample is compared, four at a time, with eight color standards in Octet comparator block. Manganese can sometimes be present in well water, causing very troublesome staining and discoloration problems. Controllable with proper treatment. * Ships as hazardous materials. Added at checkout. The DPD-FAS titration test kit measures Free and Total Chlorine in 0.2 ppm and 0.5 ppm increments. The distinct color change allows for accurate readings even at very low or very high chlorine levels. The drop-count method allows for measurement of high chlorine concentrations, in increments of 0.5-1.0 PPM. Most standard test kits cannot measure Free or Total chlorine readings over 10 PPM. Useful in better determining breakpoint chlorination, this test kit was created for use in commercial and public pools. If bromine is being used, simply multiply the tests results by 2.25. 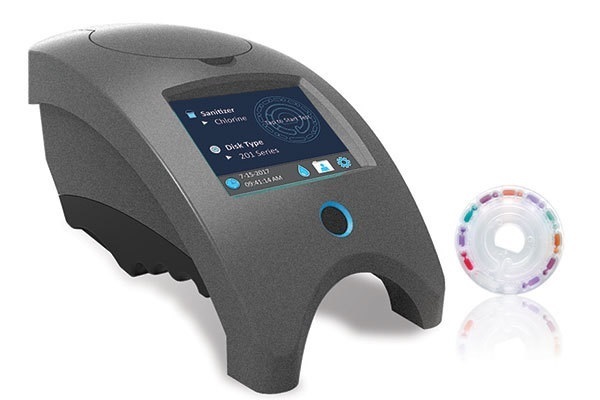 The DipCell Color Comparator displays Biguanide concentrations from 0 to 75 ppm, and pH levels from 6.8 to 8.2 for 50 tests. The DipCell, Biguanide and pH 15 ml test reagent bottles, and instructions are packaged in a plastic clamshell. The #2062 ColorQ Biguanide Pool/Spa 5 is one of 5 all-digital testers, that test for Biguanide and Biguanide Shock, as well as some other important tests. Eliminate all the color-matching and guesswork. Use this link, for complete information. 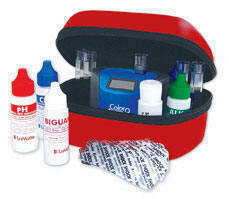 The DipCell Color Comparator displays Biguanide concentrations from 0 to 75 ppm, and pH levels from 6.8 to 8.2 for 50 tests. The DipCell, Biguanide and pH 15 ml test reagent bottles and instructions. Shock is measured by a drop count titration. If your pool or spa uses a salt chlorine generator, this Professional-Grade Test Kit, providing all the testing, you should require. The #1749 Tracer PockeTester digitally measures salt and TDS levels, from 0-9,999 PPM and Temperature from 32-149°F. The Insta-Test PRO 600 Test Strips, contain 100 strips and tests for Free Chlorine (0-10 PPM), Total Chlorine (0-10 PPM), Bromine (0-20 PPM), Alkalinity (0-240 PPM), pH (6.2-9.0), Total Hardness (0-800 PPM) and Cyanuric Acid (0-250 PPM). 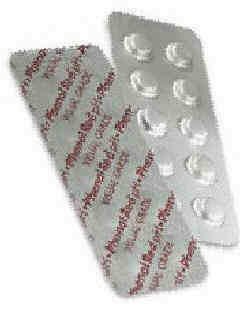 The Insta-Test PRO Phosphate Test Strips contain 50 strips and measure phosphates, in the range of 0-2500 PPB. Includes a convenient carrying case and a salt calibration standard. Professional-Grade, but easy enough for home pool or spa use. If your pool or spa uses a salt chlorine generator, testing the salt level is very important, for proper operation. 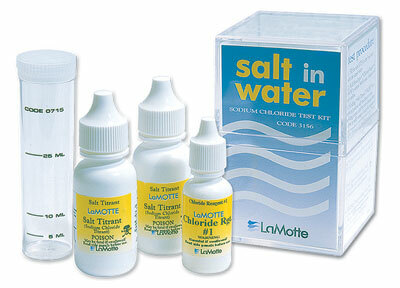 This Sodium Chloride Test Kit is an easy-to-use drop count titration kit. The salt (NaCl) content is measured by counting each drop of titrant, added to the sample tube. The kit comes in a sturdy, plastic case with two 30 ml salt titrant bottles, one 15 ml chloride reagent bottle and one clear sample tube with cap. Click here for Electronic Salt PockeTesters. For all Spas, Swim Spas and Hot Tubs. Nano-Technology Destroys organic wastes and improves water clarity. Using new technology, you can reduce chlorine or bromine usage and get better results.